Urban trams: (horse-drawn) 1 May 1869 - ? ; (steam) 1879 - ? ; (electric) 1 May 1894 - today. Interurban trams: (steam) 8 Sept. 1887 - 25 July 1937; (electric) 21 June 1894 - 31 July 1978. Métro: (pré-métro) 1969 - today; (true métro) 20 Sept. 1976 - today. Trams (TB, then STIB): 1435 mm. Interurban trams (SNCV): 1000 mm. 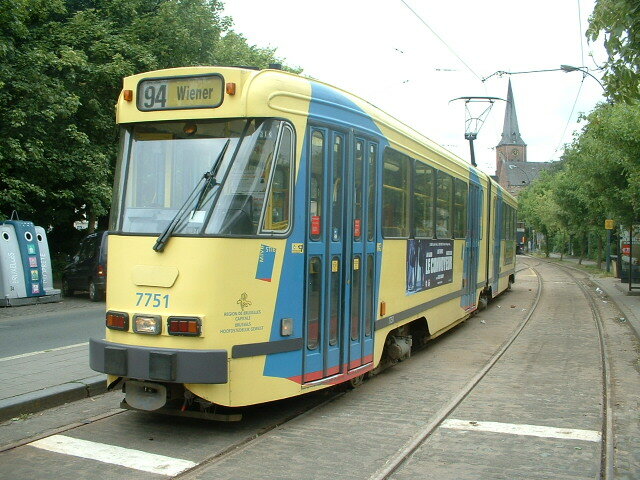 The Brussels Tram Museum (Le musée du Transport Urbain Bruxellois / Het Brussels Trammuseum) in Woluwe has a large number of preserved Brussels trams and runs some of them regularly on the Brussels tram network for tourists. 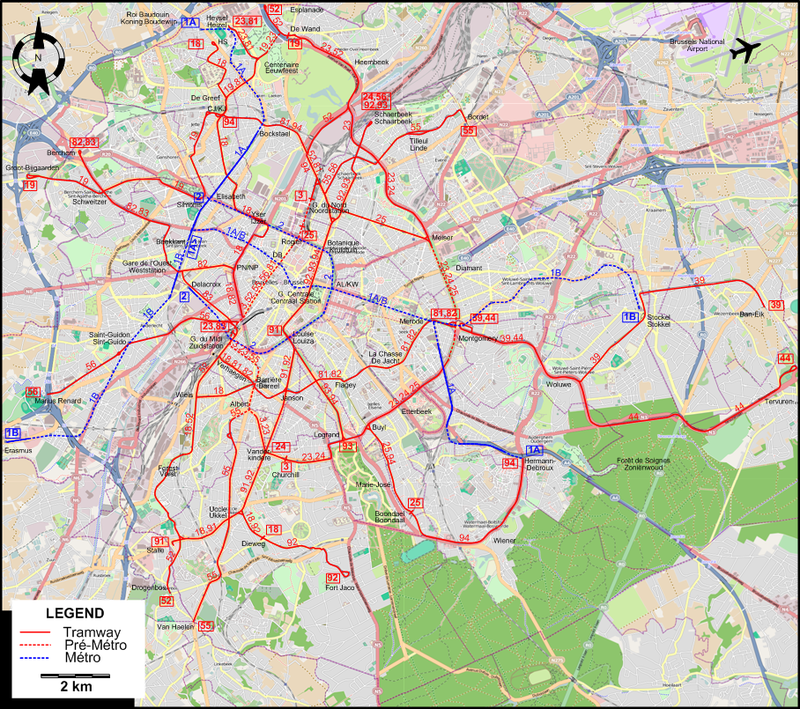 Brussels: Railway & tramway map. Exeter [England]: Quail Map Co., 1984. Davies, W.J.K. The Vicinal story - Light railways in Belgium, 1885-1991. Scarborough [England]: Light Rail Transit Association, 2nd ed., 2006. De Meurs, J. "The 1958 World Fair and the Brussels tramways", The Modern Tramway, Sept. 1958 (21:249), p.198-209. Decock, P. La STIB quadragénaire: aspects divers d'une histoire mouvementée. Bruxelles. STIB, 1994. Hansart, Y.-L. & Skelsey, G. "Brussels: Tramways plan for a rosy future", Tramways & Urban Transit, July 2005 (68:811), p.260-265. Historique des lignes des tramways bruxellois. Bruxelles: Musée privé de documentation ferroviaire (MUPDOFER), 1990. Kirk, D.D. "Vicinal Route List", Modern Tramway & Light Railway Review, Jan. 1963 (26:301), p.27-28. Koenot, L., Justens, S. & Hamal, T. Tram 2000 - Flash 1996. Bruxelles: Hamal, 1996. Skelsey, G. "Brussels tramways: The last three years", Tramways & Urban Transit, Jan. 2002 (64:769), p.12-15. Pulling, N. "Systems Factfile No.50: Brussels, Belgium", Tramways & Urban Transit, Nov. 2011 (74: 887), p.435-438. Skelsey, G. "The end of the Brussels 7000-class PCCs", Tramways & Urban Transit, Apr. 2010 (73: 868), p.142-143. Skelsey, G. "Tramways of the STIB since the Second World War", Tramways & Urban Transit, July 1999 (62:739), p.252-255. 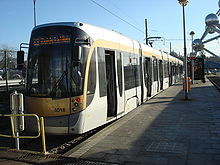 Skelsey, G & Hansart, Y.-L. "Brussels: Developing the Metro", Tramways & Urban Transit, Apr. 2014 (77: 916), p.165-167. Skelsey, G & Hansart, Y.-L. "Still growing: Brussels' tramway expands", Tramways & Urban Transit, March 2014 (77: 915), p.112-116. Also, thanks to Guy Cools (from Brussels, Belgium) and Joachim Nijs (from STIB/MIVB in Brussels, Belgium) for information obtained through personal communication.